This is at least the second version of the Elva Bag that I have made from Bags: The Modern Classics by Sue Kim. This book remains one of my favorite and most used cache of purse or bag patterns. 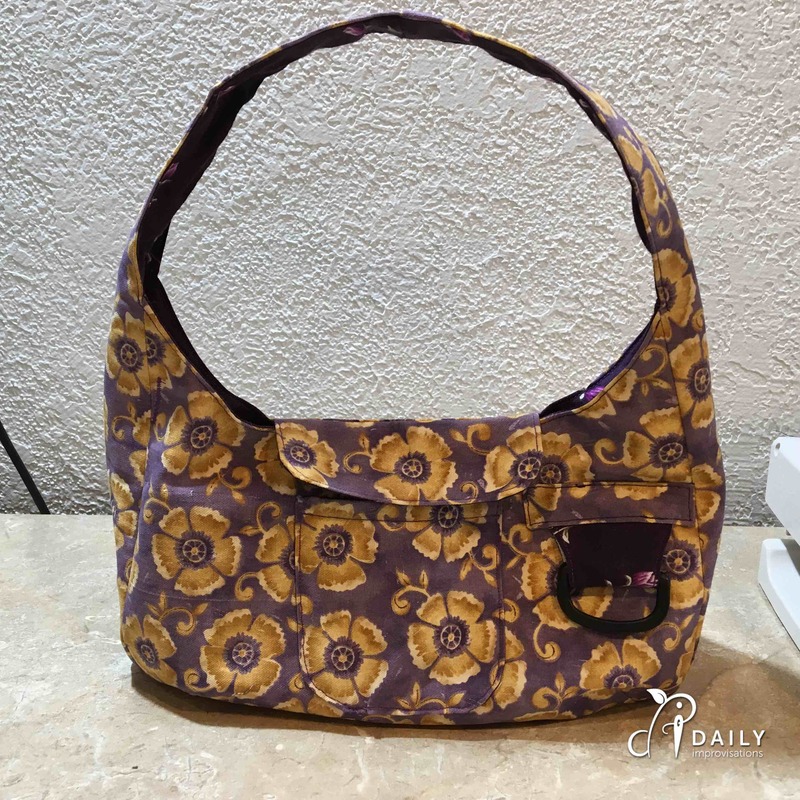 The Elva Bag is a great medium small size. It curves into its handle in a visually pleasing way. I had one minor problem with the fabric that could have turned into a major problem if I didn’t take care of it. That was a flaw in the fabric for one of the large outer side pieces. Since I didn’t have enough fabric to cut another piece, I forged ahead. At first, I wasn’t convinced the flaw was going to be that big of a deal, but after working on sewing the purse together, I had to admit that it was enough of a weak spot that it could unravel and ruin the whole purse. I needed to patch it. Just putting a plain patch on the purse seemed like it would like out of place to me. Even a fun shape was going to look too random and weirdly positioned. So, it occurred to me to add a ring to the mix. It was challenging to sew it on the bag already constructed, but I tried it anyway without undoing any seams. It made me realize that next time something like this shows up, it would be MUCH easier to make it look good if I wasn’t working inside of and close to curved seams. If there is a next time, I will remind myself to patch things up before sewing pieces together! I started the patch with one idea of attachment in mind, but decided it wasn’t going to work well. I neglected to get a good view of how I places the top raw edges of the ring lop over the partially mended fabric flaw, so don’t get confused by that in the video. Those raw edges were pretty much centered over the flaw, and then the top rectangle was topstitched over that. I would also allow more fabric for folding under around the outer edge of the rectangle next time. I was trying to avoid bulk, but it ended up making it more difficult to keep the edges neat. As usual, I added lots of extra pockets. You get a good view of that on the video below. Those are made basically the same way as I made the inset zipper pocket in my grandson’s polar fleece tunic. Each pocket was attached on the separate piece of fabric BEFORE the bag pieces were all sewn together. The Elva bags I have made so far have been for granddaughters. I figured it was a size they could use now, but should also grow with them. I also hope to make a version for me, although I may make the handle longer. I do prefer to be able to sling bag over my shoulder. I will probably up-size it a bit, too, because I have some embroidery from a skirt that I want to save and it is a bit too large for the original Elva Bag pattern. But if you try any of these bags, I think you will see that size adjustments are pretty easy.